I have tried, as much as possible, to reduce our use of single-use plastic. I know that there is always more that I can do so it is a work in progress, or as some would like to say, a journey. As with any journey, it is also easier if you are connected with like-minded travellers so I am a member of a couple of different Facebook groups whose members have similar goals. 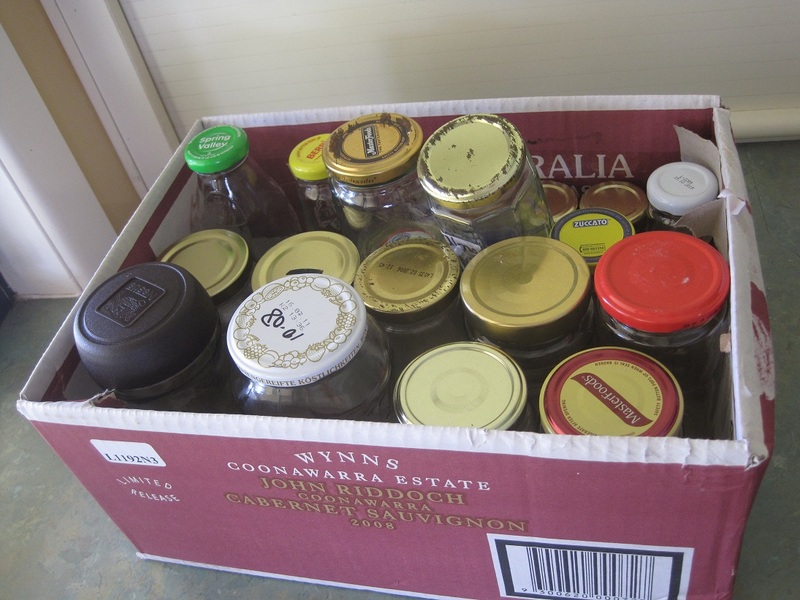 Some people are keen to remove all plastic, however, I am not about to throw away all of the plastic containers I have (to landfill) so that I can replace them with glass. On the other hand, I am happy to look for glass when I need some more. After much research, I recently purchased 2 dozen Ball preserving jars. You can read all about them in this post. I have used some when I made jam recently but am also looking at other ways of using them. I am aware that some people regularly freeze food in glass but that is not something that I have really done much so I decided that some research was in order as I know several people have had problems with glass jars breaking in the freezer. This is not a saving of resources or money so I want to avoid that happening. It turns out that for a glass jar to be suitable for freezer use it must have straight sides – that is no shoulder where it slopes in to the neck of the jar. The preserving jars which I chose meet this criteria and are also deemed as suitable for freezer use on the panel on the box. Naturally, you also need to use commonsense and not put hot jars into the freezer and leave suitable headspace for the food to expand when frozen. I also choose to chill them first in the refrigerator before transferring to the freezer as well as keeping the lids loose until they were completely frozen. This strategy seems to have been successful. Here are some jars of frozen mango puree and refried beans which I was about to transfer to the small freezer downstairs. I tend to keep this freezer for storage and items which I use on a day-to-day basis in the freezer section of the refrigerator in the kitchen. The other purpose for which glass can be used is when taking your own containers to be filled at the shop. This afternoon I took one of the smaller jars to the deli counter at the supermarket and bought olives. There was no problem with the staff weighing the container prior to filling to to assess the tare weight and the price sticker was attached to the bottom of the jar. 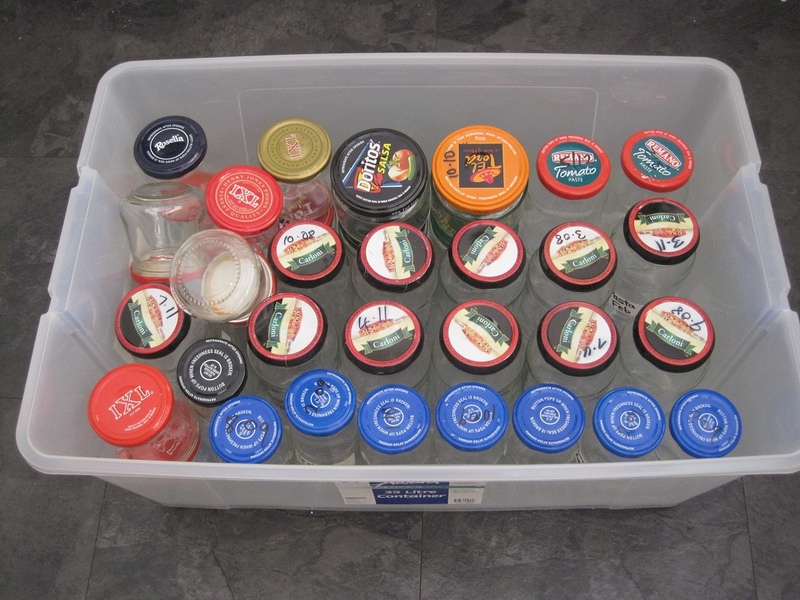 Plastic containers certainly have their place and I will continue to use them rather than discard simply for the sake of discarding them, however, it is an interesting exercise to test the boundaries as to how and where glass jars can be used. Just to prove that I don’t always live up to what I write here is a photo of my kitchen bench this morning. Well, everything was certainly not in its place. Saturday morning is not usually the best time at our place. We have both had a long week at work and despite the best of intentions, I have usually run out of steam be the time I get home. The empty box on the floor and the wine on the bench were part of a delivery of purchases made by The Duke while we were away the other week. 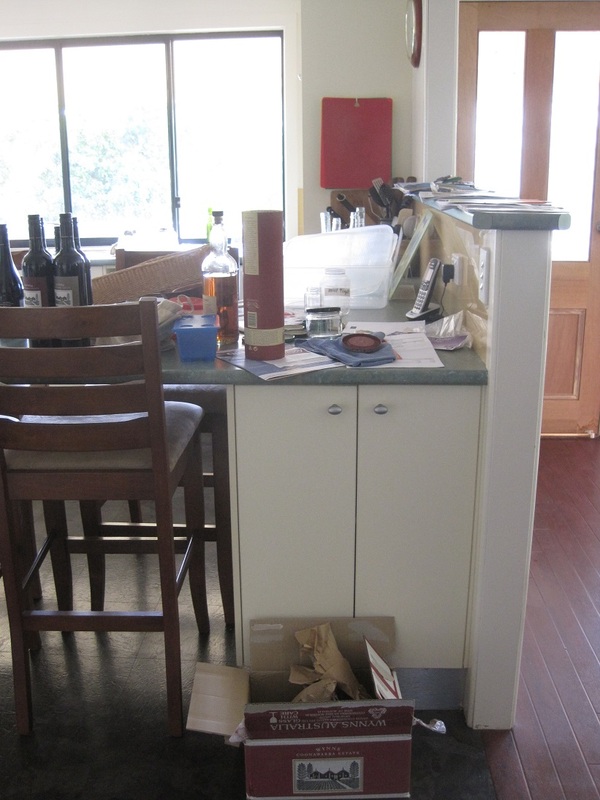 There is an assortment of paperwork that had not been dealt with as well as some clean dishes and numerous glass jars and bottles. So, what is their place? The packaging from the wine has gone into the recycling. The box was repurposed to hold some jars that I have listed on Freecycle. The paperwork has been sorted into recycling and a pile to be filed. I keep 2 plastic tubs of jars in my pantry. One holds the ones which have pop-top lids which I use for preserving and the other tub has an assortment which I keep for storage etc. There were too many jars so it was time to cull them and keep only the best ones. I only keep about 4 different style/size of jars with pop-top lids so that I can use a consistent size when making something like pasta sauce. The excess jars have been listed on Freecycle but if no-one wants them I will drop them off at the op shop. The wine has been relocated to the wine rack storage in the cellar. Alas, it is not strictly a cellar in the true sense of the word but it is downstairs and maintains a fairly even temperature. The Duke and I took the opportunity to tidy up and sort out the contents of the rack. It is now in a more logical sequence and hopefully we will easily be able to locate what we are looking for in future. As usual, one thing led to another and I now also have some excess coffee mugs to take to the op shop as well as 2 low folding chairs to put on Freecycle. The less stuff we have, the easier it is to keep everything in its place.